This is a two-part, transparent resin for creating a clear, hard finish on paper, cards, photos, cardboard, canvas, wood, and more. 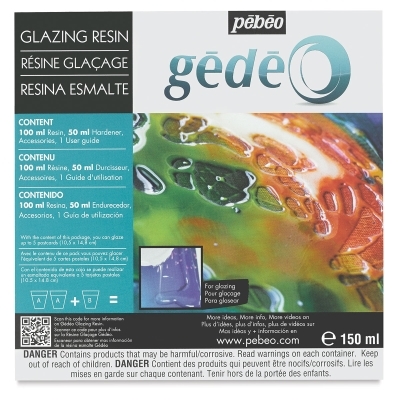 Ideal for scrapbooking and multimedia projects, Gedeo Glazing Resin may also be used for "magnifying" effects on canvas, or to add dimension to flat surfaces. When applied to flat surfaces, the resin levels out to form rounded edges that are controlled by the size and shape of the surface. Glazing Resin dries within 24 hours to form a hard, non-yellowing, transparent coating. Use Glazing Resin for securing found objects and small items into a flat vessel and solidifying them into the clear resin coating.